Getting sash window draught proofing right is no easy task. In fact many London sash window companies can only complete two windows per day, per person. With that in mind, you must be extremely careful in selecting a good London sash window draught proofing company for this project. We recently draught proofed 11 windows in Clapham, London. We needed to replace the sash window sills as well. The main part of the job draught proofing, took two days. We have a mobile vehicle setup for sash window draught proofing which allows us to price cheaply and effectively. Our machinery speeds the process, and although an investment of significant cost. One well worth it for our clients who experience minimal disruption to their London home. Not to mention, when your carrying out a building project, meeting deadlines is extremely important. To draught proof sash windows you must remove them, and then install new sash cords. These sash cords should be made in England high quality nylon core. If you don’t use quality sash cords for your draught proofing systems then you’ll be at a disadvantage, it’s highly likely the sash cords will snap long before they should and this is a false economy. So for the sake of an extra few pounds per window it is vital to ensure that you use high quality sash cords for your project. We purchase our sash cords directly from London Sash Window Repairs Ltd. You can buy their draught proofing and materials at URL provide here – https://londonsashwindows.com/draught-proofing-sash-windows/ They offer high quality imagery that clearly shows how you’ll draught proof a sash window. Just take a look at this image. It’s probably the best resource on the web available today for professional or enthusiast. Thanks very much for allowing us to use your image, it’s highly appreciated. As you can see draught proofing is installed in the lower of the sash, and the meeting rails. The upper sash also has a draught proofing system installed. This creates a seal all around the window and overall, it’s a very good system to reduce the amount of heat lost in your home. Sash window draught proofing needn’t cost a fortune either, just a few years and the reduction in draughts means it will of paid for itself already. I highly recommend this service to anyone that is fed up with icy draught howling through their homes. You’ll notice the difference instantly on completion of the draught proofing system and your home will begin to warm up nicely leaving you with a much more comfortable home. As part of the draught proofing system new parting bead and staff bead are installed. These are the timber trims that installed to stop the sash falling out. They also have the draft seals installed onto them. As part of the additional service you’ll also get new sash window furniture. New Brighton Fasteners are supplied to improve security and help drag the meeting rails together which will make things more comfortable and draught proofed. 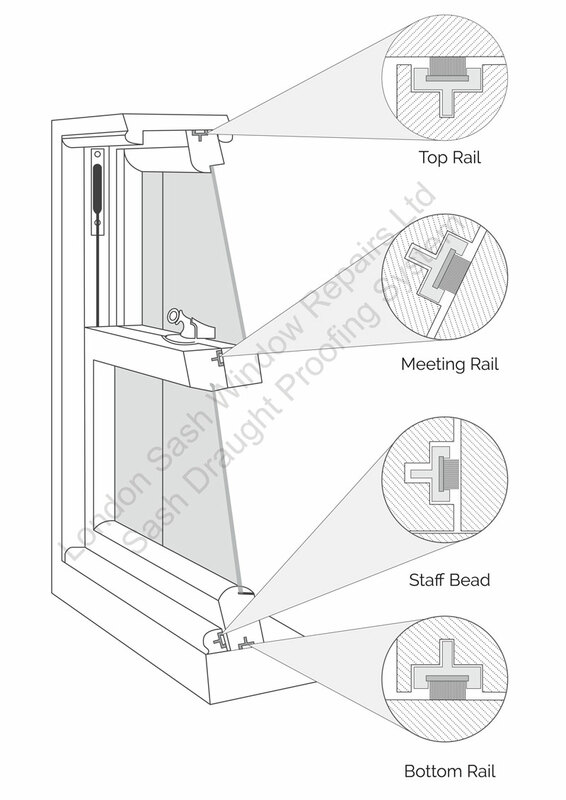 If you think you could benefit from this project sash window draught proofing then please do not hesitate to contact me.